Situated in dominating position, Piazzale Michelangelo is considered Florence terrace. The square was built in 1869 after the design of architect Giuseppe Poggi, when Florence was the capital of Italy (1865-1871). After having visited the wonderful Romanesque church of San Miniato al Monte, some flights of stairs lead to embankments and to the historical centre. Are you planning to spend your holidays in Florence? Visit our website: you will find a selection of holiday luxury apartments for rent in Florence (luxury apartments at Piazzale Michelangelo and in other Florentine districts, apartments in panoramic position...) among which to choose the accommodation that fits your needs. For your next holiday in Florence, rent a luxury apartment in Piazzale Michelangelo. 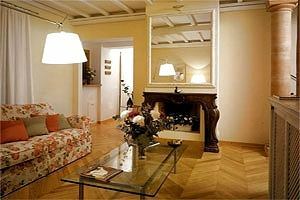 Luxury apartment atop a hill near Piazzale Michelangelo, only 15 minutes from Florence historical centre. Max 6 beds, private parking lot, satellite TV, Internet connexion, air conditioning.